Prinal is a 15 old boy. Prinal lives with his family on a small farm. His father earns cash by working as a casual labourer on adjoining farms. Their income does not cover the costs of their large extended family or having 3 children in high school. Prinal is studious and very dedicated to a future as a chef so we are seeking educational support to help make this possible for him. 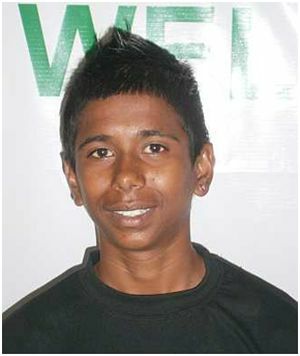 Prinal enjoys attending school and his favourite subject is English. When he is not at school he loves playing soccer. Prinal travels to school each day by bus. When he grows up, Prinal wants to be a chef. Prinal is a well behaved student who is eager to learn. He tries so hard to do well in school even though his parents are facing financial constraints. He is a bright and promising student.